Use this worksheet to list Financial Aid offered from each college in order to compare and contrast. Download and print off a copy or pick up copies in the Guidance Office. https://fafsa.gov - This is the direct, OFFICIAL link to complete your online FAFSA. DO NOT USE THE FAFSA.COM WEBSITE!!! Unfortunately, where there is a government program, there are scammers looking to take money from unsuspecting citizens. In this case, the most important tip off for you should be that the first F in FAFSA stands for FREE. If someone is charging you money to fill out, or submit, your FAFSA, you are getting scammed, close your browser and start over. Do NOT enter any credit card or banking information. The real website for submitting your FAFSA is fafsa.gov. It is a federal government website and it uses the .gov extension. Unfortunately, someone has decided to make some money by using the domain fafsa.com, taking advantage of the fact that most people are more familiar with the common .com extension. Google gets it right, but if you “remember” the website and type in FAFSA.com, you won’t end up on the real FAFSA website. The financial aid filing season officially began at 1 a.m. ET on Monday, Oct. 1 with the launch of the 2019‒20 FAFSA® at fafsa.gov. Most students and parents are eligible to use the IRS DRT to electronically transfer their 2017 tax return information. Each year, more than 20 million FAFSAs are submitted, resulting in more than $120 billion in federal grants, loans and work-study funds to help pay for college or career school. Students who plan to submit the FAFSA online should create an FSA ID as soon as possible at StudentAid.gov/fsaid. If a student is considered dependent for FAFSA purposes, one of the student’s parents also needs to create an FSA ID in order to sign the FAFSA online. Each person must create his or her own FSA ID to avoid issues and delays with the financial aid process. Once the FAFSA is processed, the school will use the FAFSA information to calculate the amounts and types of financial aid the student may qualify for, and the school will send the student a financial aid offer. Financial aid offers come from schools, not the U.S. Department of Education, and each school has its own schedule for awarding financial aid. Students are encouraged to complete the FAFSA as soon as possible to take advantage of any early state and school financial aid deadlines. These are the I.D. 's that must be created and used to "electronically sign" the FAFSA at the end of the form. 2019-2020 School Year - Free Application for Federal Student Aid -To print a hard copy of the FAFSA. Not recommended to complete & mail. Use for a worksheet and to see what you will need to answer when you complete online. Complete guide/directions to filling out the FAFSA. The easiest way to apply for TAP is through the FAFSA. Make sure you have completed your FAFSA! 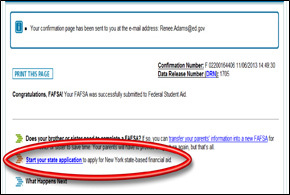 New York State (NYS) residents attending NYS schools can link directly to the TAP application from the FAFSA submission confirmation page. If you exited the FAFSA before completing the TAP application – and you filled in your New York State address and a New York State college on the FAFSA – HESC will automatically receive your information in about three days. HESC will then send you an email or postcard with directions to complete the TAP application online. Received this notice from HESC? Apply now. At the beginning of the online TAP application, you will be prompted to create a HESC-specific user name and personal identification number called a HescPIN. You will use your HescPIN when "signing" your TAP application and when accessing your HESC account information in the future. Financial Aid Programs for New York State - Tuition Assistance Program (T.A.P.). Applying can (should) be completed when you finish the FAFSA. On the Confirmation Page there is a link to completing your state's application. Tool to put in your financial information to get an ESTIMATE on what financial aid you may be eligible to receive. Compare colleges by cost, average financial aid & debt, graduation rates/retention, earnings, etc. University, etc.). This form is NOT Free.